According to the latest data from the Centers for Disease Control and Prevention’s Autism and Developmental Disabilities Monitoring Network, one in 59 children lived with autism in 2014, up from one in 150 in 2000. Autism’s increasing prevalence calls for planners to plan and design the public realm to improve the quality of life for people with autism. 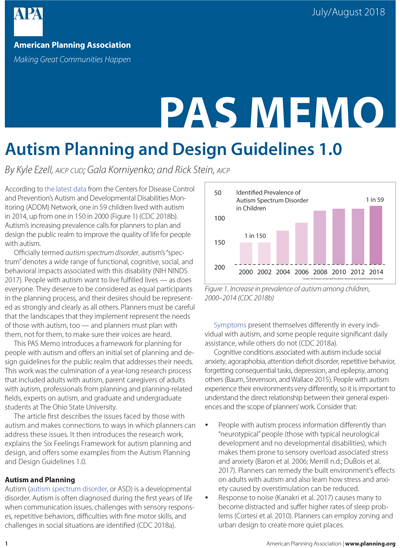 This PAS Memo introduces planners to the Six Feelings Framework for planning for autism and offers examples of how to apply these design principles to make the public realm more safe, comfortable, and inclusive for everybody in a community. Kyle Ezell, AICP CUD, is a professor of practice at The Ohio State University’s Knowlton School’s City and Regional Planning program and an administrator of the American Planning Association’s Planning for Underserved Populations Interest Group. Ezell’s work leading students in planning and designing for adults with autism was published in the July/August 2018 Planner’s Advisory Service Memo and featured in the October 2018 edition of Planning. Along with undergraduate studios, At OSU, Ezell engages students in planning practice-related research associated with underserved populations. He also owns Ezell Planning and Design to bridge ideas from the academy to the planning practice. Rick Stein is the Principal and Owner of Urban Decision Group – an urban planning and professional services firm located in Columbus, Ohio. Mr. Stein is co-founder of the Urban Mobility Research Center (UMRC) – a think-tank devoted to helping plan for changes to cities and transportation networks, including the impacts of Autonomous Vehicles (AV), robotics, and Artificial Intelligence. Mr. Stein’s work tends to focus on the secondary impacts to commerce and commercial and industrial properties, as well as the overall impacts on cities and regions. Since 2017, Mr. Stein has partnered with Urbanism Next – a research arm of the University of Oregon – whose focus is providing information about the potential impacts of emerging technologies – autonomous vehicles, e-commerce, and the sharing economy – on city development, form, and design and the implications for sustainability, resiliency, equity, the economy, and quality of life. Mr. Stein also sits on the board of the non-profit group Autism Living – an organization focused on integrating housing and employment options for autistic adults into existing neighborhoods and communities. Mr. Stein holds a B.S.B.A. (MIS) from Bowling Green State University and a Master of City and Regional Planning from The Ohio State University.